The Komodo editor is a popular programming editor (Windows/Mac/Linux). 1. Download and install Komodo. 2. 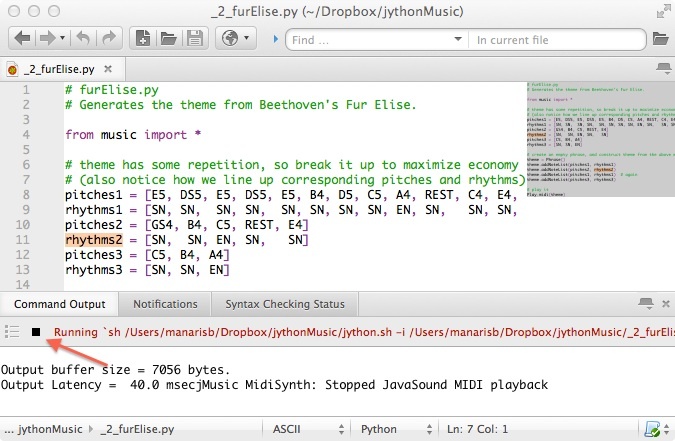 Within Komodo, open the file “furElise.py”, which is located in the jythonMusic folder, as shown below. 3. Run the file “furElise.py”, as follows: select from Tools > Run Command, or simply issue CTRL-R.
Mac OSX: enter “sh %D/jython.sh -i %F” (without the quotes) in the text box for Run, and enter “%D” (without the quotes) in the text box for Start in. Windows: enter “%Djython.bat -i %F” (without the quotes) in the text box for Run, and enter “%D” (without the quotes) in the text box for Start in.Linux: same as Mac OSX. 5. If you hear the music, you’re all set. 6. To run the next command, you must manually finish the current command. To do so, click the black square (see red arrow below). Using the Komodo editor to edit and run a jythonMusic program.